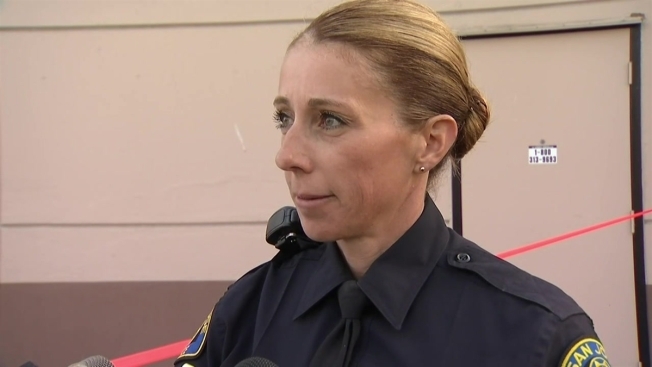 San Jose police provide updates on an hours-long standoff with an assault suspect that ended without incident on Monday, Aug. 20, 2018. An assault suspect was taken into custody Monday evening following an hours-long standoff in San Jose, police said. The suspect, a 36-year-old man, was wanted for assaulting his mother, according to police. Officers arrived to an apartment building on Luz Avenue, just north of Alum Rock Avenue and west of Interstate 680, and saw the suspect with a weapon. He then went back inside an apartment in a "very agitated state," police said, adding the suspect was armed with a handgun. Officers then set up a perimeter and blocked streets in the area while they negotiated for several hours to get the suspect to surrender. Police said the victim, the suspect's mother, is safe. The suspect was taken into police custody shortly after 6 p.m. without incident after he surrendered to officers.